A very quiet and small Swiss ski resort La Tzoumaz is great place for a relaxed and family holiday away from the noisy bars of large resorts. Guests enjoy an amazing view of the Rhone Valley. Many years ago the village of La Tzoumaz was called the Mayens-de-Riddes, and only dedicated people were skiing here. Today the resort is part of the 4 Valleys, so the luxurious Verbier and its neighbours are also accessible from here. In the region of skiing more than 400 km of trails, 100 lifts, there is a single ski pass. Thanks to the well-developed infrastructure with a number of shops and restaurants, trails of different levels of complexity and an excellent choice of chalets, the resort has become one of the world-famous. The cosy chalets in the regional style of construction, as well as the striking panorama of the mountain world of Wallis and the view of the beautiful Rhone valley, create the unique atmosphere of the Swiss ski resort La Tzoumaz at an altitude of 1500 m. The earlier name of the Mayens-de-Riddes winter sports town, which was replaced in 2005 on La Tzoumaz, is a wide highland pasture of Riddes and allows you to imagine where the historical roots of this area go. Development in a ski station with modern comfort began in the 1960s, when La Tzoumaz was connected by ski lifts and ski runs with the Verbier ski area. Today, skiers of a family ski station have a choice between two ski areas. 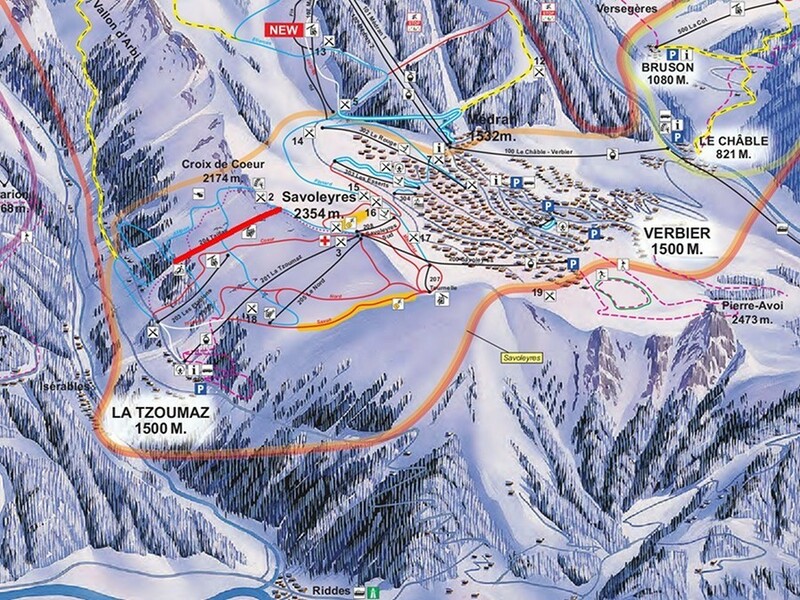 "Little" ski resort Savoleyres / La Tzoumaz - ski stations La Tzoumaz and Verbier with 55 km of ski runs. Or a large riviera of ski slopes in Switzerland 4 Vallées with 410 km of pure fun on skis. In any case, even the most demanding skiers in La Tzoumaz will be satisfied with the good snow conditions at the resort, which is provided by the northern location. Alps2Alps is a team of professionals that always provides its clients with the very beneficial transfer services to the most popular alpine ski resorts, including La Tzoumaz. For us absolutely doesn’t matter when you are going to have your rest - during the peak season or at the end of the season - we will guarantee the most reliable, comfortable and, no less important, the lowest transfer for you. All of the above will only lead to the fact that our base rate for ski transfers will decrease - we never overstate our prices by any reason. Besides, Alps2Aps provide large discounts for off-season transfers and in the midweek. If you want to save on transfer, get to know that the most beneficial offer is a trip outside the peak season or in the middle of the week. From Monday to Friday we offer transfer prices with a 60% discount, than on weekends. The cost of your transfer will also depend on such factors as the vehicle availability and vehicle utilization, transfer schedules and other costs as toll roads and parking charges at the airport. If you are planning to travel in a large group and you have any additional requests, please contact us to discuss details of your future transfer. Seasonal opening dates at La Tzoumaz are always dependent on weather forecast and snow conditions. The area of La Tzoumaz-Savoleyres has its own 55 km of trails. Here you can enjoy magnificent low-mountainous slopes with excellent snow conditions. On the northern slopes the snow remains in good condition for a long time, and on the southern slopes, you can take a sunbath. La Tzoumaz boasts a long sleigh run in the French-speaking part of Switzerland. This resort is especially popular with newbies on skis and families since just above La Tzoumaz there is a large number of wide gentle slopes ideal for the first steps on skis. But also the trained athletes will be satisfied here, for example, on the 7 km ski track from the Savoleyres ridge at an altitude of 2354 m and to the skiing station. Quieter than neighbouring Verbier, La Tzoumaz is very popular among families with children. Here you can see small lifts for children, a natural ice rink, a heated pool and the longest sledge track in Western Switzerland (10 km). La Tzoumaz has many opportunities for practising many winter sports: downhill skiing, snowboarding, cross-country skiing, sledging and snowshoeing! And don’t worry if you don’t have any sports equipment with you - at every point of rental, you can rent quality ski equipment. There is a wide choice of accommodation in the resort - from ordinary apartments to hotels with a full range of services. Children will have fun in the ski schools and kindergartens which are working in La Tzoumaz. La Tzoumaz is a combination of the advantages of a large ski area and a quiet family vacation. Alps2Alps always gives a guarantee of the most quality transfer services with high level of comfort and reliability for our clients. And, that is also a very important thing, with the lowest possible prices during the whole ski season! Start your trip just like the future alpine ski holiday you would like to have: truly amazing from the very beginning! Notice when the high season is coming, the prices for all the best transfer services to popular ski destinations are growing up very quickly. That's why we recommend our clients to book their shuttle to La Tzoumaz as early as possible. Do it with no delaying for tomorrow, just for your peace of mind. If you can't find any information you need, the resort or some service, don’t doubt to contact us. Our team will gladly help you according to your preferences. Choose Alps2Alps to ensure your perfect ski holiday start!